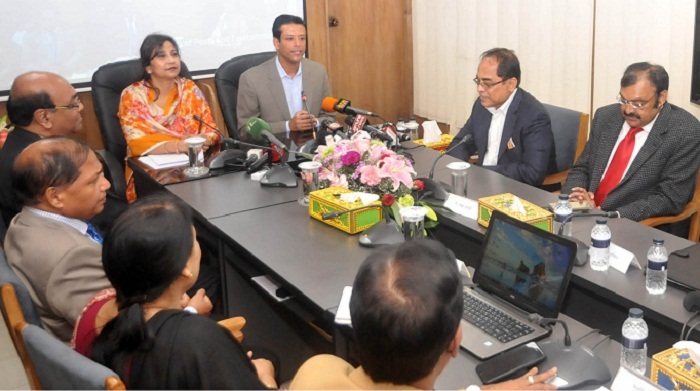 Prime Minister's ICT Adviser Sajeeb Wazed Joy on Monday launched a new mobile banking service named 'Daak Taka', saying the service will allow the country's people to open their bank accounts at Tk 2 only. The launching ceremony was held at the Bangladesh Post Office (BPO) conference room. Joy, who is also the son of Prime Minister Sheikh Hasina, made a presentation, attended by State Minister for Posts and Telecommunications Tarana Halim, Posts and Telecommunications Division Secretary Shyam Sundar Sikdar, Bangladesh Telecommunication Regulatory Commission (BTRC) chairman Shahjahan Mahmud, chairman of D Money Bangladesh Ltd Anjan Chowdhury. "I'm delighted to launch the service," said Joy adding that the rural people will be more benefitted from the service. Joy said the government is trying to reach its service and other allowances to people's doorstep through mobile apps and internet. "There're 8,000 post offices across the country. As there's no bank at the union level, the BPO is working to provide financial services digitally in rural areas," he said. "The aim of the digital Bangladesh is to make public life easier," he added. Bedsides, Tarana Halim said the government is bringing in changes in the BPO and the BPO will be fully digitalised within 2021. 'Daak Taka' is Digital Wallet. A digital wallet refers to an electronic device that allows an individual to make electronic transactions. This can include purchasing items on-line with a computer or using a smartphone to purchase something at a store. This will also allow using different channels like card, app and mPOS (mobile point of sale). Near Field Communications (NFC) and Quick Response (QR) code facilities have been included for money transaction considering facilities required for the citizen. The 'Daak Taka' service users will be able to make transactions with the other financials institute. The commercial service of the 'Daak Taka' software will be launched within three months. The service is aimed at bringing about 3 crore unbanked people under banking services.